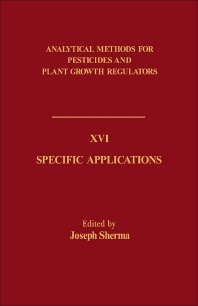 Analytical Methods for Pesticides and Plant Growth Regulators, Volume XVI: Specific Applications presents analytical methodology for insecticides (ethoprop, fenoxycarb, fenvalerate) and five herbicides (chlorimuron ethyl, chlorsulfuron, glyphosate, metsulfuron methyl, sulfometuron methyl). The book discusses the determination of two important pesticide classes, anticoagulant rodenticides and fumigants, and the determination of other pyrethroid. Toxicologists and people involved in pesticide analysis will find the text invaluable.